It feels good to hear you're appreciated, right? Well, one adorable little bird made sure to tell its owner it loved being petted by talking, squawking and squeaking up a storm. 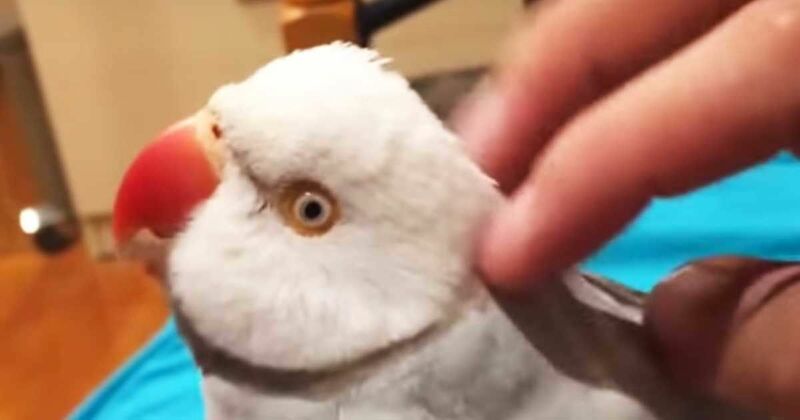 In the viral YouTube video, this pretty white bird talks away as its owner gently rubs its soft head feathers. At first, it sounds like the bird is even saying, "Rub me, rub me, rub me!" While these kinds of birds can mimic words, it's not totally clear if that's what the bird is actually saying. Although, then it seems to proclaim, "What are you doing?" when its owner starts to pet more slowly. Throughout the video, the tiny bird shows its big personality by talking away while it enjoys some much-appreciated petting. It's one of the cutest bird videos out there, so don't miss it! Check out this hilarious little bird right here below. What a cutie, right? Don't forget to share this funny video with your friends on Facebook, Twitter and Pinterest!